The fact is that, despite all the close scrutiny that the body text of a book receives, most readers fail to notice the careful design choices made by the publisher at all—and that is how it should be. Imagine listening to a long speech by a man who constantly waves one hand around wildly as he talks, or a woman who speaks so quietly you have to strain to hear each word. How long do you think you would be able to stay focused on the speaker’s words? It’s the same for books—as readers, we want to stay absorbed in the meaning of the writer’s words, without being distracted by quirky lettering or frustrated by font that is too small to read clearly. The choice of a font for the body text is one of the most important but under appreciated decisions you will make in formatting your book. 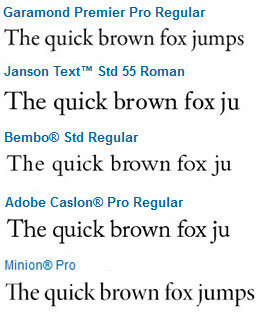 No reviewers will applaud a well considered typeface but readers will tune out in droves if you get it wrong. Unlike the cover design which aims to call attention to itself, the body text must be unassuming and the primary consideration when choosing a font is always Legibility and Readability. There are over 90,000 fonts currently available so the choice can be a little overwhelming to say the least, so here is some general advice about how to decide and my list of ten fonts that will work in most occasions. The word ‘font’ is now commonly used interchangeably with the term ‘typeface’ due to the influence of modern publishing software. However, the terms do in fact have distinct meanings in typography. A typeface is a complete set of characters (upper case & lower case letters, numbers and symbols) that have been designed in with similar features to create a distinct textual style. In contrast, a font is a specific combination of typeface and point size. For example, a typical book might use the typeface Garamond with a point size of 10, so the font is 10-point Garamond. Furthermore, 10-point Garamond is a separate font to 12-point Garamond. When deciding which type of font to use you first need to determine how your book is going to be read. If your book is going to be printed, the general rule is to use a serif typeface for the body text and a sans serif typeface for the headings, footnotes and cover design. An eBook, on the other hand, is more likely to be read off a screen and so you may choose to switch these around and use a sans serif typeface for the body text as this will be easier to read on small screens and low resolution. Display typefaces should be reserved for cover design and headers and are commonly used in children’s books for this purpose. 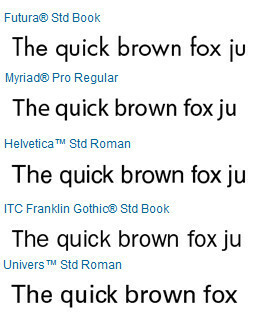 Different typefaces at the same point size will appear larger or smaller depending on the height and the width of the glyphs and the spacing between the letters – an economical font that allows more characters on a page without compromising on legibility will help to keep the page count down and save printing costs. Want some further font references? Adobe has a useful font finder tool on its website that you can use to research different typefaces and most books will contain a reference to their typeface on the copyright page, so you can see firsthand how they look on the page. You should also check out Julian Benson’s wonderful (and slightly tongue in cheek) Flow Chart for choosing a typeface as well as the incredible infographic Bold & Justified which neatly explains everything you could ever want to know about Typography. If you are trying to find a good font combination for the body text and headers your book then try Douglas Bonneville’s 19 Best Font Combination Chart for some great examples. What are you hoping wishing preying for? grerat publish, very informative. I’m wondering why the other experts oof this sector do not notice this. Thank you. Very helpful! I know of several others who will be interested in seeing your post. This was very useful information. I knew my book did not look right in the standard Times Roman font – but I did not know which typeface to use until I read this. Thanks!. Good information. But, ironically, I have to mention that the font used in this post is not all that easy to read. Increasing the point size would certainly help, but as a screen font, it seems to me that it leaves a bit to be desired. The text color is uneven on my screen, and that’s distracting. Thanks for the comment Teri. It’s funny that you mention this, as I have just this week been tinkering with the site design, including trialling a few different fonts. So this is very timely and valuable feedback. 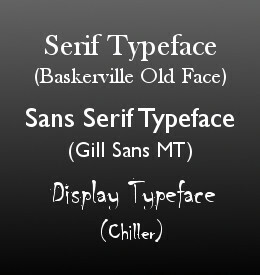 It also shows just how tricky it can be to find the right typeface. I’ve just changed it back to the original font settings. You may want to change “san” to “sans”, since “sans” means “without” in French. to get facts regarding my presentation subject, which i am going to present in college. Self Publishing Part 8: The Wisdom of Fonts – 10 book typefaces that can’t go wrong | Enter "The Sity"